The Khumbu Three Peaks is one of our most fantastic expeditions and a good opportunity to enter the world of climbing in the high Himalaya. We use a programme of trekking up the Khumbu valley then ascending peaks of increasing altitude (Pokalde 5806m, Kongma Tse 5820m) to build up to the ascent of Island Peak at 6189m. This process of 23 days is great for acclimatization but also for exploring several mountains and enjoying some great high level camping in the heart of the Himalayas and their breathtaking views. During the trip you will learn many valuable skills in safe travel at high altitude, mountaineering techniques, glacier travel, scrambling and mixed snow and ice terrain. This is an ideal stepping stone for experienced hill walkers or low altitude mountaineers toward peaks in the greater ranges. Imja Tse, as it is known to Nepalese, not only provides an enjoyable climb but also provides some of the most spectacular scenery of Himalayas in the Khumbu region. Seen from the summit, the giant peaks of Nuptse (7,879m), Lhotse (8,501m), Lhotse Middle Peak (8,410m) and Lhotse Shar (8,383m) make a semi circle to the north. The views of Makalu (8475m) in the east, Baruntse and Ama Dablam in the south add more charm for climbing Island Peak. 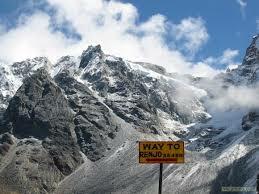 The route follows the Chukkung Valley to Base Camp, from which the summit is a challenging 6 to 9 hour climb depending on conditions. The route includes rocky paths followed by snow and ice, a 300 meters headwall which is fixed with a rope to clip onto, and an exposed snowy summit ridge about 300 meters long which can be narrow and precipitous. 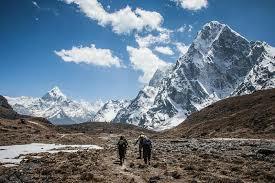 For more information and booking please visit the Khumbu Three Peaks’s page on the Adventure Alternative UK website. Day 22 - 23 Fly to Kathmandu and depart. Day 3-9 – Fly to Lukla & trek through Khumbu.